if you've got little kids at home who love diggers, trucks and mud, then a construction theme for a party is a perfect idea, and the best news is, that it is an easy one to pull off and budget friendly too. Because a construction themed party is typically not a 'branded' party, you can keep decor simple and choose a couple of colours for your base. 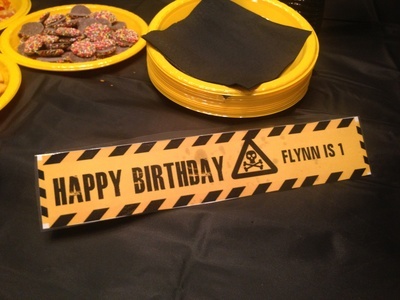 For my son's recent 1st birthday, I chose the colours of yellow and black, as these are the common colours for construction vehicles and also for hazard and caution labels. If you're saving money, then simple decor choices are yellow and black balloons, with colour co-ordinated streamers, and a cheap black plastic table cloth with yellow plates. As these are all common colours, you can find some great deals in your local dollar shop too. Have a look through your child's toy collection, and see what you can 're-use' for the party. I grabbed a bunch of his Bob the Builder toys and Tonka toys to use as props around the party table; no expense at all for these, but they look very effective as balloon weights or party pieces. 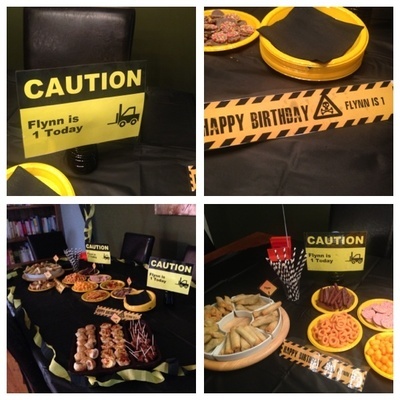 I used printables to create food labels, a cake banner and also just to add signs around the table. These were all free and easy to create. There are so many options for a construction themed cake, and whilst I had grand plans to create a whole Tonka truck out of cake, in the end I went for simple and fun, and it created an effective result. If you're seeking inspiration for a cool construction cake, there's a great gallery of ideas here. For my own cake, I just baked a square mudcake slab, and iced it with chocolate frosting. I then stole my son's digger from his Bob the Builder collection, and popped this on top. With a little artistic license and some chocolate frosting, I emptied a bag of M&M's onto the cake and down the side of the cake to look like the digger was picking up its load of colourful sweets. On top of the chocolate frosting I added some crushed oreos to make it look like mud, and finally I added some Cadbury's Fingers to all the sides of the cake. As a final touch, I also used one of the printables featuring my son's name as I had left no room to physically ice it on to the cake. This was a pretty cheap cake to make (under $18) and the kids loved the final result. If you're having a craft table, there are some great free printables available on the internet. I love these free Bob The Builder colouring in sheets available to download here. Just add a few of these to a table with pens or crayons and you have an easy craft station. Playdoh with a few tonka trucks is an easy activity to set up, and kids will enjoy making loads of playdoh for their trucks to carry. Other activities that can be easily adapted to suit a construction party would be an obstacle course using home made hazard cones as obstacles, a digger pinata and also pin the tail on the donkey, but instead of the tail and the donkey you can have pin the truck on the construction site, with X marking the spot. For the ultimate in simplicity make a small sandpit and throw in a load of diggers and trucks, it's easy entertainment for the children that they'll enjoy. Fabulous ideas here! With some planning, it can be easy to have a fun and low cost Birthday party.